Picture Credit: John Grant Kitchens. Blue Eyes coordinates well with blue island and maple base cabinets. Quarks are very visible to fall in love. Blue Eyes Granite is a Canadian Lady; she is also called Brown Eyes Blue and Reflect Blue. Her sisters are Labrador Antique, Volga Blue, Blue Pearl, Sapphire Blue and Azul Bahia. Blue Eyes gives a gray looking at the first sight. The base color is gray, grayish brown or smoky gray. But the unique iridescent quarks, which are bright blue to bright purple, are catching your eyes. The surface is very homogenous but blue dots are not. They are randomly spread over the gray base. In a kitchen remodeling gray-based stones are very popular these days. You will have a hard time visualizing them by matching your cabinet colors. Blue Eyes is a sweet candidate to make a soft match with the white, cherry, and even dark espresso kitchen cabinets. Usually backsplash selection is easy as following the pale blue and gray tones. Sometimes the blue tone wall colors completes the kitchen very well. Picture Credit:Angie Keyes CKD. Blue eyes countertop cheers the kitchen. Very detailed oriented job, moldings and legs are perfectly located. Picture Credit:Timberlake Design Build. 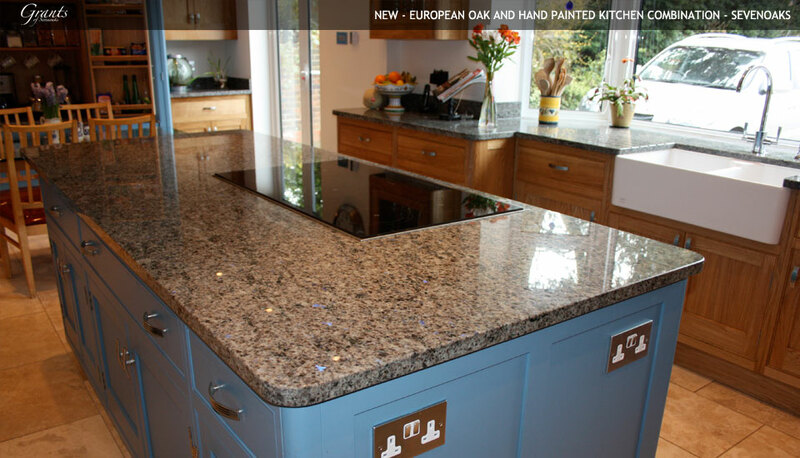 Lovely French Cottage style kitchen with Blue Eyes Granite, farmhouse sink seems gorgeous . Picture Credit: Feinmann Inc. Lovely color selection to pop the blue eyes granite in design . I like the pendants especially same color with the blue quarks… Fine tasted contemporary design..
Picture Credit:Kitchengalleries Blue eyes granite with dark color cabinets. Such a visible pleasure. Please do not hesitate to add your pictures and your comments to a make more educative article about Blue Eyes since she is authentic and not used very often. If you would like to educate yourself about granite material, I may suggest you to check the Granite Countertop : Kitchen Countertop Materials article of mine.